You are here: Home / Health / Habits That Are Inhibiting Your Weight Loss. Habits That Are Inhibiting Your Weight Loss. (ThyBlackMan.com) Losing weight can be one of the hardest things to do effectively for some people. On its surface, it seems like it should be a simple task. There are tons of guidelines and tips that one can follow, so why is losing weight so difficult? Unfortunately, many bad habits can be developed over the course of a lifetime, and these bad habits typically inhibit weight loss. Changing a developed habit can be very difficult for some people, which is especially troubling when a habit is negatively affecting one’s health. So what are the top bad habits that inhibit weight loss, and what can you do to change these habits? 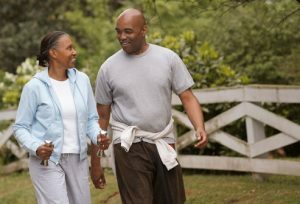 One of the biggest detriments to a weight loss campaign is a lifestyle that has little to no physical activity present. Physical activity is typically one of the cornerstones of most weight loss plans, and skipping over it could inhibit your ability to lose weight. Physical activity burns off the calories that you take in from your food, thus allowing you to lose weight. Although, physical activity is important, it doesn’t mean that you need to run seven miles a day to lose weight. It is generally recommended to exercise at least 30 minutes a day. These thirty minutes can encompass a wide variety of activities such as playing a pick-up game of basketball to simply taking a brisk walk on your lunch break. If you struggle to get off the couch and onto the road, court, or field, then it’s probably time to change your habits and adopt a more active lifestyle. It may seem extremely obvious, but heavy eating is a huge obstacle in losing weight. Even with this realization, its still very difficult for some people to change their bad eating habits. It is very hard to go from eating big meals to eating smaller portions. The solution to this is to slowly wean yourself off of big meals by steadily decreasing your portion sizes for each meal. Another way to deal with binge eating is to eat healthier foods. Healthier whole foods are typically much more filling than their junk food counterparts, allowing you to eat less but still feel just as full. Finally, try to limit your snacking, and if you do snack make sure its healthy. If you’re unable to do this, or simply just don’t know how to snack healthier, then there are plenty of services you can turn to. These services can provide snack delivery, and will provide healthy food that is not only good for you, but also able to help with your diet. For some people smoking and cigarettes are a crutch that help them make it through their day. These people continue to smoke cigarettes even when they know that the act of smoking has several negative effects on the body. What people don’t know is that smoking can also greatly inhibit your weight loss. Smoking directly harms your lung capacity, making it much more difficult for you to get out and complete physical activities. Smoking is also a static activity that takes up a lot of time. Instead of using your smoke breaks at work to head out back and spark a cigarette, try using them to take short walks instead. However, be careful when you do decide to quit smoking. The increased stress from your bodies’ lack of nicotine may cause you to compensate by turning to other unhealthy habits such as overeating. However, if you’re able to maintain a proper diet while you quit smoking, then you will see a large amount of health benefits.